“I haven’t really thought about it, I’m busy writing an article for the Spec Trib,” was my reply. “You’re looking at Facebook,” Stefanie said. “Inspiration?” was my feeble attempt at witty repartee. Then, it struck me; I will make something for supper, drink some beer and write about it. Brilliant. I made an Irish red a few months ago, which turned out very well. I was going to save it for a mini-competition with the Winnipeg Brew Bombers in January, but since stock was dwindling, and it is an awesome beer, I decided to drink it with supper. The Irish red, according to BJCP style guidelines is: “An easy-drinking pint. Malt-focused with an initial sweetness and a roasted dryness in the finish.” There are some nice caramel notes in this style as well. Cut up potatoes, carrots, onion, red pepper and garlic, coat it with olive oil and throw some rosemary on there. If you’re partial to another spice, throw it on the veggies. Just stay away from the hot spices this time because they will overwhelm the feature presentation, the beer. Put everything in a roasting pan and place it in the oven. Precook the bacon (as many strips as it takes to wrap your chicken) in the oven for about seven or eight minutes. I took the chicken breast and sliced it through the center for thinner pieces that are easier to roll. Thinly slice or shred the Dubliner cheese and put it on one side of the chicken breast. Roll up the chicken and wrap it with a strip or two of half-cooked bacon. Put the chicken into the same dish that you cooked your bacon in and cook that for 25 minutes or until cooked. I cored and shredded the cabbage then cooked a couple pieces of bacon in a pot. After the bacon was nice and crispy, I broke it up into lots of pieces then poured a cup of the Irish red into the pot, along with a dollop of mustard and a splash of vinegar and waited until that came to a boil and then tossed the cabbage into the pot. I cooked that with the lid on for about five minutes, until it was cooked but still crispy. Add a pinch of salt if you want. Chives and parsley will go well with this side, but I used dill. 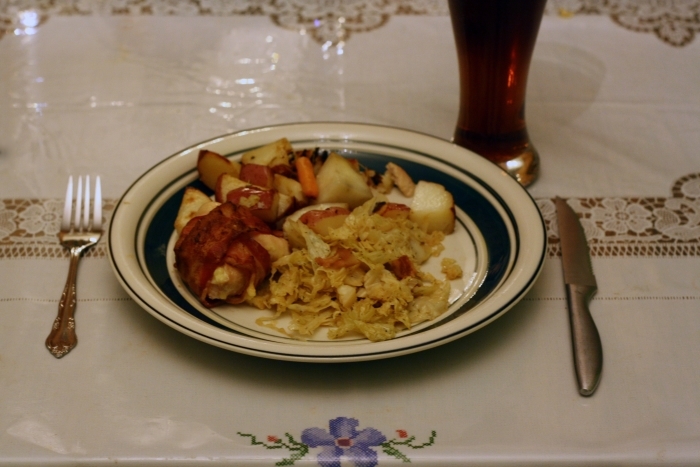 My twin four year olds didn’t like the cabbage but Stefanie liked it, and she really enjoyed the bacon chicken with the cheese stuffing and thought the beer went well with the dish. I get bonus points when I make restaurant quality meals and this one made the grade. Next week is the Half Pints Pro/Am Beer Challenge. Friday, November 29 – Beer dinner at Mise at 7:30 with beer pairings by David Rudge of Half Pints. Tickets are $65 and available at Half Pints or Mise. Saturday, November 30 – Awards Ceremony at Barley Brothers at 7:00 PM with talks from the head judge, Mark Heise, and Half Pints brewmaster, David Rudge. Emceed by Nicole Barry of Half Pints.